It is commonplace to observe that the experience of seeing a movie is a lot like the experience of dreaming. Watching vivid, fantastic and shifting images unfold before you in a dark space seems to naturally invoke comparisons to the dream state. I thought a lot about the relationship between movies and dreams during production and post on my film, The Art of Dreaming. One of the goals of that film was to try to capture the experience of dreaming. And one of the things I noticed is that silent films are much more dream-like than sound films. There are a lot of reasons for this. One of them, I think, is that the lack of extended conversation in silent films helps keep the experience from being overly verbal, overly rational. But the most important reason, I think, has to do with the nature of dreams themselves. Sound does not play a very important part in most dreams. For most people, dreams are primarily kinesthetic, visual, and emotional, not aural. .Just think about the way people describe dreams that they’ve had. People talk about what they saw, what they did, or what they felt. Not what they heard. (There are two exceptions to this. Conversation is the first. People will sometimes report what was said in a dream, though dreams don’t frequently focus exclusively on conversation. And occasionally people will report hearing vivid and elaborate music in dreams. I’ve experienced such dreams myself, where I heard music far more complicated that I could have written in waking life, but these dreams are the exception rather than the rule, and so extraordinary that they seem very special when I have them). This is why I love silent films so much. Despite the truism that movies are like dreams, very few modern films really are. Very few modern filmmakers are comfortable and skilled in the use of silence as a positive element. This is one of the great losses of modern cinema. Sound has become a way of concretizing the film world, anchoring us in a specific time and place, or overwhelming our emotions with manipulative cues. If you want to see how sound can be used to create a truly dreamlike feel, take a look at Carl Dryer’s 1932 film Vampyr. Made in the early days of sound film, Dryer shot it as a silent film, with all the sound added in post-production. Dialogue is kept to a minimum and sound effects and foley are added sparingly. You hear the sound of a door shutting, but not the footsteps of the person walking to shut it. This adds to the bizarre and dreamlike feel of what is truly one of the strangest films ever made. One of the frustrations I’ve encountered with my film The Art of Dreaming has been trying to get it shown at film festivals. I suspected a 40 minute film would be a tough sell, because festivals seem to want to program either full-length features (approximately 75- 120 minutes) or shorts under 20 minutes long. There wasn’t any place for The Art of Dreaming. But that 1 1/2 to two hours length for a feature film is such an arbitrary length and doesn’t seem to have much to do with the way people watch movies anymore, an anachronism from older times. There’s a lot of talk these days about whether contemporary television is better than film, meaning that mainstream TV nowadays is generally more interesting and innovative than mainstream films. Most of the talk has to do with how the economics of each medium has forced filmmakers to play it safe and take less risks than their television counterparts. I’d like to take a step back and talk more about more fundamental differences in the art forms. One of my writing teaches, Ela Thier (theindependentfilmschool.com/) once said in class that the difference between TV and movies is that TV presents episodes in a person’s life, whereas a film presents the most important event in a person’s life. A bit of a generalization, but I think there is a lot of truth to this. Thus in Sam Raimi’s Spider-Man (as in the comic), Spider-Man’s defining moment comes when he discovers that the two-bit criminal he didn’t bother to stop went on to kill his beloved Uncle Ben. But by the time of Raimi’s third movie in the franchise, when it’s revealed that Uncle Ben’s killer was really another criminal, it all just seems both too much and too the same. When I wrote for Marvel Comics, we were told that a good story involves the hero facing a moral choice that defines him or changes him. But can you really write this same story issue after issue, month after month? Many episodic series solve this problem by sometimes having stories where the hero is not the true protagonist, but just plays a part in someone else’s story. Will Eisner’s weekly Spirit comic used this device often, where The Spirit would only be a tangential figure in the story of a small time hood or some other Everyman. Another way that episodic stories can deal with this challenge is to have an ensemble cast. Not every Buffy The Vampire Slayer story is about Buffy. Individual stories could focus on Willow, or Xander or Giles, or any one of the large and rotating supporting cast. Of course, sometimes films and TV can skirt these fluid boundaries, like the movie trilogies that plan from the start to tell one story, or the TV miniseries that do the same thing. And in pure, escapist action movies, like Raiders of the Lost Ark, you can have an exciting story that doesn’t necessarily tell anyone’s most important event. My point isn’t to say that one form is superior to the other, but to point out how, even beyond the economics of production and distribution, there are inherent rules to any art forms (of course, rules are made to be stretched, broken, twisted and re-formulated), and whether you choose to write episodic TV or full-length films depends on which type of story you want to make. 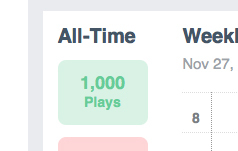 The Art of Dreaming hit 1000 plays on Vimeo today! Congratulations to all! Let’s keep spreading the word! A couple of weeks ago, I reprinted an excerpt from John August’s website where he and Craig Mazin were talking about the pressure from film producers to cut corners and trim budgets at the expense of the artistic merits of a film. Here’s another example of the way producers can interfere, not to save money, but to try to make a film more commercial, more marketable, this time from the recent movie Gravity. If you haven’t seen it, it’s a film about a disaster in space that leaves shuttle astronauts stranded in low-earth orbit. It’s shown entirely from the perspective of the astronauts, with no cutaways to earth, and is entirely about the natural and real-life hazards of existence in space, with no added threats of evil saboteurs or menacing foes. This is from an interview the director Alfonse Cuaron did with the site io9. So there was no pressure anytime from anyone to focus more on the destruction and less on the characters? When you go into the process, yes, there are a lot of ideas. People start suggesting other stuff. "You need to cut to Houston, and see how the rescue mission goes. And there is a ticking clock with the rescue mission. You have to do flashbacks with the backstory." But we were very clear that this was the film that we wanted to make. I can’t imagine this movie leaving [the main character’s POV]. But I understand people pitch things. So what was the weirdest suggestion that you heard on how to change Gravity? This is the thing, you will always hear voices. With making a film it’s like trying to create a tune in the shower, while you have a hundred people singing around you. You have to focus yourself in on the tune that you’re trying to create. Because you have hundreds of people singing different songs at the same time around you. There’s always that. The whole thing of the flashbacks. A whole thing with… a romantic relationship with the Mission Control Commander, who is in love with her. All of that kind of stuff. What else? To finish with a whole rescue helicopter, that would come and rescue her. Stuff like that. via All the Ways Hollywood Tried to Ruin Gravity. If you’ve seen Gravity, you understand how these suggestions would have made it a different movie, turning it into a generic action movie, instead of the intense, unique, and personal experience that it is. The cutaways would have relieved the tension, rather than adding to it, the romantic sub-plot would have softened the impact and made the rhythm, cadences and resolutions the sort of things we’ve seen a thousand times before. Obviously, there is no easy answer to how to surmount these kinds of pressure. My usual inclination to avoid big budget filmmaking (and the subsequent pressure from investors) and move away from mainstream film’s obsession with expensive, clean and polished production values, would not have worked for Gravity, which required a kind of photo-realism that only comes at great expense. What is always required is a clarity of vision and a dogged perseverance to achieve that vision, and the fortitude to say no to people who aren’t saying yes to you. Take the time to experience this film. It is not just for watching. Let it be as though you are in the dreams with Maya. Only then will the film make sense and remind us of all the madness we experience in our own rapid eye movement sleep. It’s a solid film that acutely captures the restlessness of thought we experience when plagued by grief or crisis. via The Art of Dreaming at Gorilla FIlm Magazine. And don’t forget to let us know what you think of it! Zompire Vixens from Pluto is a campy and fun web-series being written and produced by my friend, Jenna Payne, who also produced my mini-feature, The Art of Dreaming. Foxy zompires invade Brooklyn in retaliation for Pluto losing intergalactic aid after it was demoted from Planet status. The Art of Dreaming just got another great review, this time from Richard Propes at The Independent Critic. Richard praised the film and script for striking a difficult balance between the human and the transcendent. He particularly singled out Kate Villanova for her lead role as Maya, calling her performance “disciplined and emotionally resonant,” and Walker Hare for his “uniquely mysterious” performance as Demon. He also gave props to our Director of Photography Che Broadnax (“offers the film a rich palette that feels both natural and oozing with mystery”) and our composer Lenny Gonzalez (“gives the film just the perfect dose of edginess”). Congratulations to all of you, and to our entire hard-working cast and crew!